OK, I'm lazy. I have four good digital cameras at the moment, but when I'm off, or going out to dinner, or shopping, I hate to carry one of my pro cameras around. I've long ago stopped waiting for that plane to crash in front of me (at least before the Trade Center, now all bets are off), but I've missed countless adorable pictures of my daughter (or Bert, for that matter). So when high quality digital point-and-shoots started appearing, I decided that I'd get one. But which one? So I borrowed a few to test, and came up with some basics. I looked at the Nikon Coolpix 995, Canon Powershot G2, and the Canon Powershot Digital ELPH S110. I'm assuming that you already have a quality digicam, and want to get one of these to tote when not working. The sensors range from 2 to 5 MP, but they all make beautiful prints as 8x10's on my Epson Stylus Photo EX. However, for me the overriding issue was size. I already have excellent digital cameras on my shelf. They do me no good unless I have one with me, and the Canon S110 is the smallest. It measures 3.4 x 2.2 x 1.1 in, small enough to fit in a pocket. The Canon Digital ELPH S110 (about $450-500 street) is a small 2MP, 100 ASA camera, but produced images that were good enough for my non-pro needs. It sports a 35-70 f2.8-f4.0 lens with a 4x digital zoom, built-in flash, a proprietary lithium battery and charger, but takes only Type 1 flash cards (no Microdrives). It also does 30 second MPG movies that are way cool, with sound. (Note: PC users with Microsoft's "Media Player" software will try to use it to play the MPGs but will fail. It needs "Quicktime" as the player, available from Apple as a free download). Selecting to record a movie is done only through a menu option, not an external control. It is an elegant looking camera. 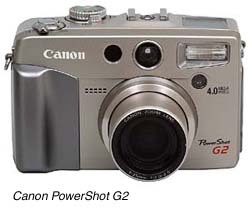 The Canon G2 ($900 street) (4.8 x 3 x 2.5 in) is the big brother, both in size and features. It has a 4MP sensor, 34-102 mm f2.0-2.5 lens (3.6x digital zoom), ASA 50-400, built in flash (with hot shoe), and uses rechargeable or standard lithium batteries (same as D30). Battery life is excellent. It takes Type I or type II flash cards or Microdrives, and does 30-second movies with sound like the S110, selectable via top control. The preview screen flips and swivels so viewing is easy from any angle, and reverses to protect it (wish my pro cameras did that!). It makes beautiful pictures, both in RAW and JPG modes. Also supplied is a nice infrared remote control. It does not come with an external charger (charges "in camera"), so if you have a second set of batteries you must swap and charge when not being used, or buy a charger (or use a D30 or DV chargerthey are the same). 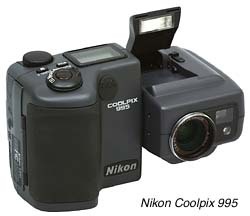 The 5.2 x 3.2 x 2.5 in., 3 MP Nikon Coolpix 995 is an equally beautiful digisnap, updated from the popular 990. It has the familiar swiveling camera and digital halves, a 38-152 mm f2.6-5.2 lens (4x digital zoom), ASA 100-800, proprietary rechargeable lithium or standard 2CR5 battery, uses Type I or II compact flash cards (and newer Microdrives), and a pop up flash (but no hot shoe). It does 40-second movies, but no sound. Movie selection is also done via menu, not external control. The 995 has a wealth of controls and features, and a system of wide and tele adapters, but carrying around extra lenses seems to me to go against the reason of having a camera like this in the first place. Still. Like the Canon G2, this is a fine digisnap and produces excellent images. The bottom line is that all the small digital happysnaps I tried make great prints, are fully featured, and have a significant lag delay unless you can keep them "pre-focused" with the shutter button half way pressed. 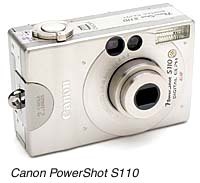 But the Canon S110 is my favorite for now because it is painless to pack along. When it packs a 5MP chip, no lag, and takes my Microdrives, I'll really be happy!